"Since uncountable ages, when the gods created the world of Tagmar, wars scourge the earth. It`s in this scenario that adventurers use swords and magic to confront supernatural creatures and constant threats. These are the heroes that forge their legends by fire and iron..."
In this game with rules in the Role playing games style, the participants control and interpret the actions of adventurers in Tagmar. 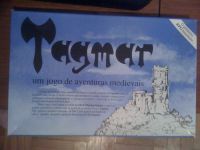 This genre also know as RPG has great acceptance in the whole world , reaching now to Brasil through Tagmar."